To organize many stuffs on small space become challenge for us. Including small spaces here are bedroom, living room, family room and kitchen. Putting many stuffs without destroying room interior beautify need skill to choose storage place and place. Here are five storage ideas for small spaces that we can consider if we want to organize many stuffs in smart way. These ideas are multifunction furniture, under bed, staircase, cabinet and basket. Multifunction furniture, cabinet and basket are storage place type, while under bed and staircase are place in our home to put these storage place. Starting from multifunction furniture. This is good storage ideas for small spaces. As seen on first picture. This is sofa with storage place for book, magazine, newspaper, DVD and so on. This storage place is placed under this sofa. So, with the same area, this furniture has two functions. Other good multifunction furniture is coffee table. A modern coffee table can be completed with cabinet. This cabinet can be used to store anything. 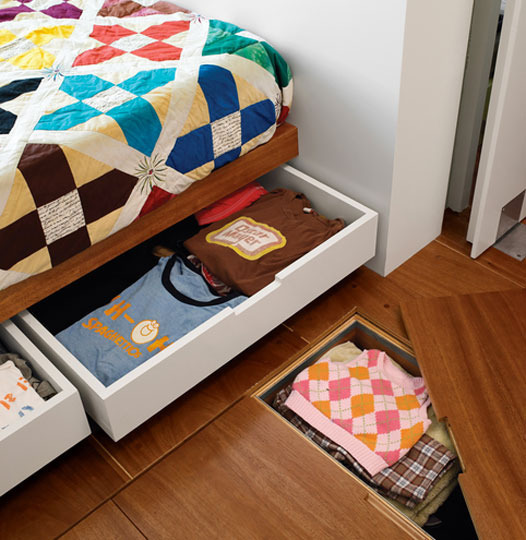 Second storage ideas for small spaces are under bed. This is creative idea to use all available space on bedroom to store so many stuffs. As seen on second picture. Here there is cabinet under bed and rack under wood floor. On this cabinet under bed, some stuffs like book, magazine, toy and so on can be stored. And on rack under wood floor, it can be used as alternative wardrobe to store clothing, shirt, pant and so on. If this rack is functioned as alternative wardrobe, it must be kept from humid factor. Third idea is staircase. 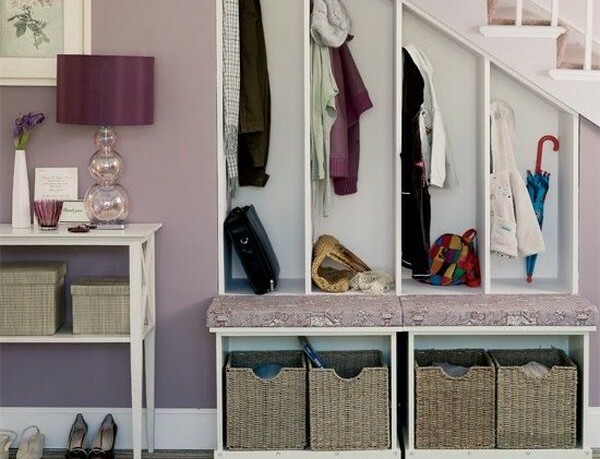 Use under staircase as place to store many stuffs is good idea. 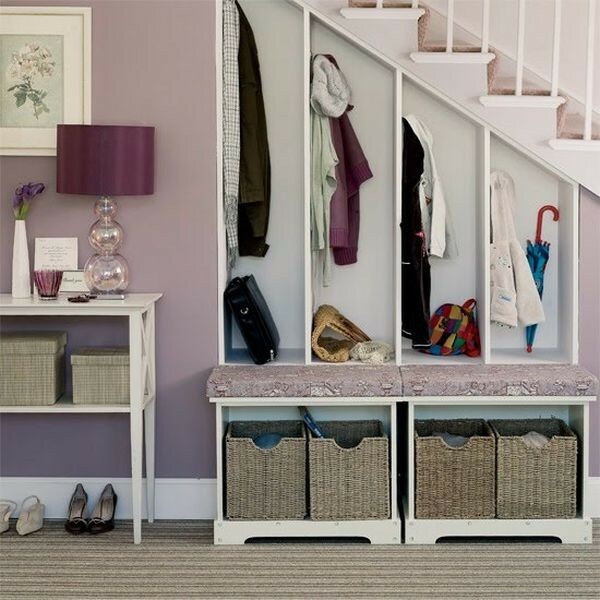 Usually, there is empty room under staircase, now this room can be functioned as storage place. As seen on third picture, here is used to store clothing, shoes, umbrella and so on. More that that, this room is also decorated with table lamp and picture on the wall. Other idea to use under staircase is installing bookshelves on the wall. Here many books, magazine and newspaper can be stored. Fourth idea is cabinet. This cabinet can be placed anywhere to store anything. This is useful home appliance. Fifth idea is basket. We can install basket on kids bedroom wall, and then use this basket to store their toys. 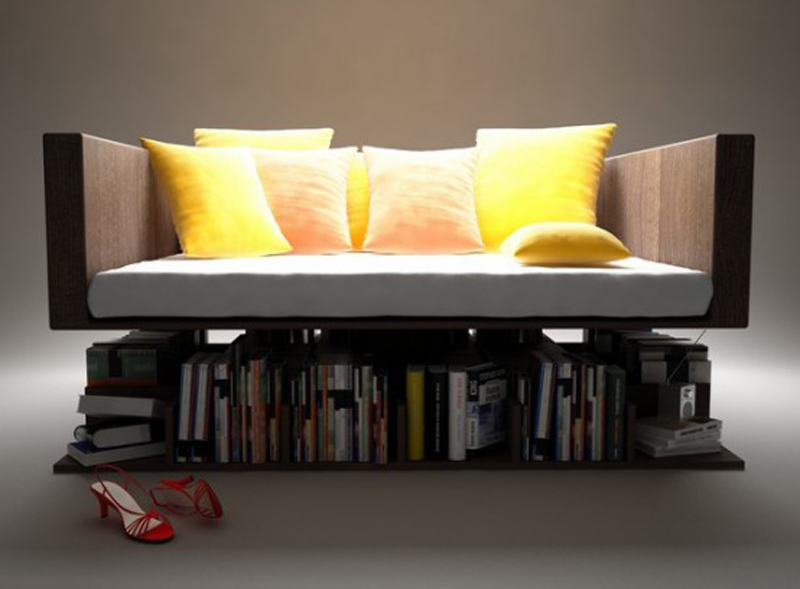 It can be good alternative for storage place under bed. Need more great design ideas on 5 Storage Ideas For Small Spaces? See our full gallery!